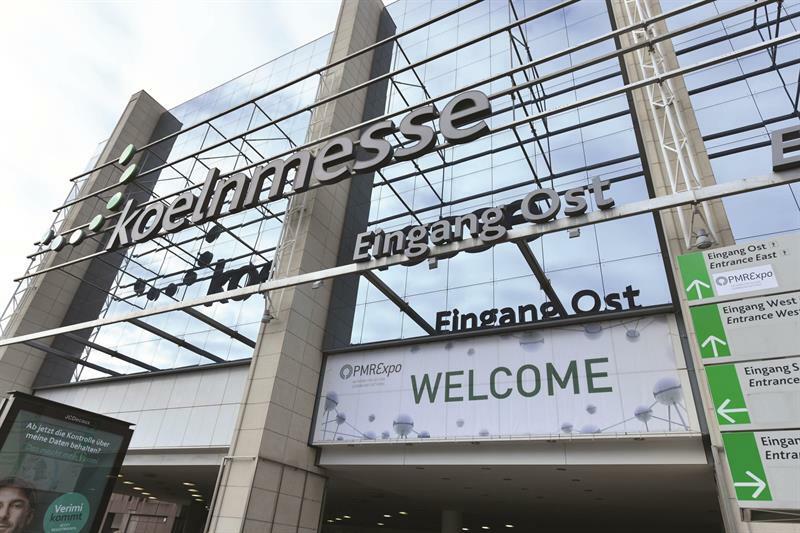 Last year’s PMRExpo was busier than ever, with the organisers claiming that it was attended by roughly 4,400 visitors and 232 exhibitors. During the conference programme, BDBOS’s head of directorate strategy and central management Barbara Held shed a great deal of light on Germany’s current thinking with regard to critical communications. She said that while no decisions have been made, a future network model has been proposed by BDBOS, which takes a hybrid approach, which in addition to leveraging the current TETRA network envisages the creation of a dedicated broadband network operating in the 450MHz band (the spectrum for which would be provided by the German regulator), and BDBOS is “fighting to get more” of this spectrum. This basic network would reuse the TETRA network’s infrastructure. It is estimated that 5,000 base stations would be required to deliver a very basic nationwide service; the current TETRA network counts already as many as 4,600 sites. As the harmonised spectrum in 700MHz has been auctioned off, the plan also envisages RAN sharing with commercial operators in that band to provide additional capacity, and obtaining additional services via commercial operators. On the device side, Held said the current vision foresees a TETRA base module (a black box with harmonised interfaces), together with a hardened commercial smartphone that will act as the control panel for the TETRA base module (which would only retain PTT and alarm buttons) and support future applications, with this combination having the ports to allow the reuse of accessories that first-responders have purchased for use with their current TETRA devices. She added that BDBOS has been discussing moving to a centralised model for procurement, terminal governance, and the delivery of some services (including standardised applications), with the 16 German states, but no final decision has been taken yet. During the event, Airbus and Samsung announced their new partnership to develop a terminal and collaboration platform that will support narrowband and broadband systems. The platform is intended to facilitate the future use of multimedia communications by German public safety users. After heading over to Airbus Secure Land Communications’ stand, Michael Wolf, its head of sales DACH, told me that part of the rationale behind the partnership was the realisation that the two companies are not competitors given Airbus’s focus on “highly reliable voice communications”, and that while Samsung is providing handsets to the UK’s Emergency Services Network project, these are LTE only. Another factor is Airbus’s expectation that there will be a long period of coexistence between narrowband and broadband technologies for critical communications. Wolf added that the “success” of Airbus’s Tactilon Dabat was the “key driver” for the company to go further in this direction, and he also highlighted customers’ desire for flexibility on the smartphone/LTE side given the difference in generation cycles between it and narrowband technologies. Tero Pesonen, chair of TCCA’s Critical Communications Broadband Group (CCBG), discussed the ongoing work to create a mission-critical broadband ecosystem and the timeline for its development and deployment. He also outlined the Finnish approach – Virve 2.0 – which will begin in Q1/2019 with procurement for a private mobile broadband core, along with commercial 4G/5G MNO radio access [the legislative changes to allow Virve 2.0 have been made – Ed]. This will be followed by the procurement of mission-critical applications in 2020. The target is to have the Virve 2.0 services tested by the end of 2022 to enable migration to begin in the following year. Pesonen said he expects that TETRA will still be in use in Finland until at least 2025, potentially even until 2030 (albeit on a regional basis). Christian Régnier, head of communication solutions department, Group Air France-KLM, gave an update on its private LTE project (which uses 20MHz of spectrum in the 2.6GHz band operating in TDD mode) at Charles de Gaulle Airport, which was prompted by issues with using Wi-Fi while scanning luggage (for example). He said it is currently awaiting the final decision from the French regulator (ARCEP) to see if it will be permanently awarded the spectrum. The company is looking to increase its fleet of mobile devices (principally tablets, with some laptops for engineers) to 10,000 in two years, rising to 15,000 the year after. In addition, it is currently trialling a single sim card set-up that will work with both Air France’s private LTE network and commercial networks all over the world, as it would be impractical for flight crews to have to swap sim cards each time they landed at a new destination. Régnier explained that this is all part of the company’s digitisation projects and that as part of these, it is looking to shift towards preventative maintenance and predicting the connectivity that will be available at any given site, and will be trialling this next year with Airbus with the data for each flight being transmitted over the private LTE network. The main driver for this is the amount of time that can be saved through preventing incidents that delay or stop planes from taking off. Tom Johnson, chairman of the DMR Association’s technical working group, delivered one of the best presentations I’ve ever seen. Taking an in-depth look at some of the issues that can be encountered when rolling out DMR networks, with a focus on the lessons learned while trouble-shooting some problems with a friend’s DMR network, which meant that it wasn’t running as well as their large MPT1327 analogue network. He noted the analogue capture effect, which means that “if a signal is 6-7dB stronger than an interfering signal, the higher signal will prevail and be decoded properly”, and his experiments confirmed that DMR requires that the “carrier-to-noise ratio needs to be 10-12dB better than the interference signal”. This means that RF noise at a site becomes more important when migrating from analogue to DMR, creating the need to remove sources of noise, and Johnson noted that urban locations can be particularly difficult, partly due to the widespread number of cellular sites. Returning to his friend’s issues, Johnson said that there were two or three sites which sporadically stop decoding DMR. “We tracked it down to the LED floodlights that were at the [sites].” These had PIR sensors for security purposes, and whenever they turned on, the inference from their inverters “completely wiped out the DMR [system]”, despite them being CE-marked. Johnson found that some of the radios on the network that weren’t operating well were slightly off-frequency and that “certain radio manufacturers’ equipment seems more prone to not working well with frequency errors even within the [standard’s] limits than others”. He attributes this to how the manufacturers have implemented their decoding algorithms. He therefore recommends checking the frequency of base stations and terminals, especially as they start to age, and added that “realigning some of the mobile stations on my friend’s network made a huge difference to the performance”. Another source of problems, which Johnson thinks is the most interesting, is modulation fidelity, which if low “increases the bit error rate [and] reduces the range”. He found that some manufacturers’ firmware upgrades and poor alignment procedures are the major cause of low modulation fidelity and it can only be detected using a digital test set. Using one, he examined six manufacturers’ mobile stations, which varied significantly in this regard. For example, a radio “that was new and out of the box and supposedly aligned” was “miles off”. One quite surprised Johnson – he picked a radio off eBay from an unknown (to him) manufacturer, “one of the ones you can buy for [about] 50 bucks, thinking that it would give me an example of something really dreadful”. Instead, it “was actually the best one, surprisingly”. Let’s shift to the exhibition hall, which at times smelt mouth-wateringly good thanks to the combination of cinnamon-flavoured baked goods and popcorn – Syndico’s decision to have a popcorn-maker complete with company-branded boxes was a marketing masterstroke, given the way it expanded its presence beyond its stand. While 2016’s exhibition stands were all about hybrid terminals and 2017’s focused on PTT over Cellular devices, 2018’s innovations in the exhibition hall were more subtle and incremental. A tour of the Motorola Solutions stand covered the ST7500, the company’s latest small TETRA radio, which weighs less than 200 grams, has an up to 22-hour battery life, is IP67-rated and has an OLED display allowing for easy viewing in sunlight and a hybrid antenna design to allow the same RF performance as a larger device. It features a new kind of accessory connector due to the need to keep the form factor compact. I also got to see the DIMETRA Express TETRA system, which can be set up in 15 minutes (though the record is six minutes and 40 seconds, which was set during a competition at CCW) and is available with one to three carriers. Showing it in combination with the SmartPTT Express dispatcher console, Motorola’s Sven Lange highlighted its ability to export historical data, adding that this is particularly important in Germany, where the regulator requires such information and can remove spectrum licences if they are being used insufficiently. The most novel piece on the stand came from Avigilon (Motorola’s recently acquired subsidiary). It demoed the use of AI/machine learning in combination with video analytics to learn normal behaviour patterns and then create alerts when unusual behaviour is detected. One of the examples shown by Robert Köhler, regional sales director DACH, was footage from an on-street camera which flagged up the vertical motion created by a refuse truck tipping bins into its hold, and another was a stairwell where people typically only walk in one direction (shown below). A different scenario showcased the power of video analytics in a shopping centre context – after receiving a short description of a woman who had stolen some jewellery, the operator was able to apply a number of filters. Once the suspect had been selected from the resulting hits, the system was then able to pull together all the footage the system had on the individual within the set timeframe. Köhler also demonstrated the extent to which it is possible to digitally zoom in using a 7K-megapixel camera, and he explained that the use of cameras with such high resolutions is attractive, because it allows one camera to perform the role of several, thereby reducing capital costs. On the Hytera stand, I got my hands on the recently launched PNC370 handset, though I was far more taken with the new VM550 combination body-worn video (BWV) camera/remote speaker microphone (RSM), which was both pleasingly compact and light-weight. I understand that it is targeted at a different price bracket from Hytera’s previous BWV/RSM device, the VM685, and given the VM550’s lack of a large touchscreen, it is logical to conclude that it is targeted at more price-sensitive users. Also on the Hytera stand was Sinclair Technologies, a division of Norsat International, which was purchased by Hytera in 2017. Sinclair’s Kelvin Law, director of sales EMEA, walked me through the product range, which is focused on antennas and filters, including a four-channel UHF combiner (below left), which allows four 60W transmitters to use a single antenna, and the transmitters can have channel spacings of 12.5KHz or closer. Law also showed me a receiver multicoupler (below right), which has 16 channels (though two-, four- and eight-channel versions are available). Law added that customers have been commenting on how solid and well-engineered they are, and that the company’s antennas are built to withstand Canadian winters, and he showed me its new range of colinear omnidirectional antennas. These use a new patent-pending technology, which he said makes them 15-30 per cent lighter than a traditional design, while also being typically 20 per cent shorter and 20 per cent stronger in terms of ability to withstand high winds. 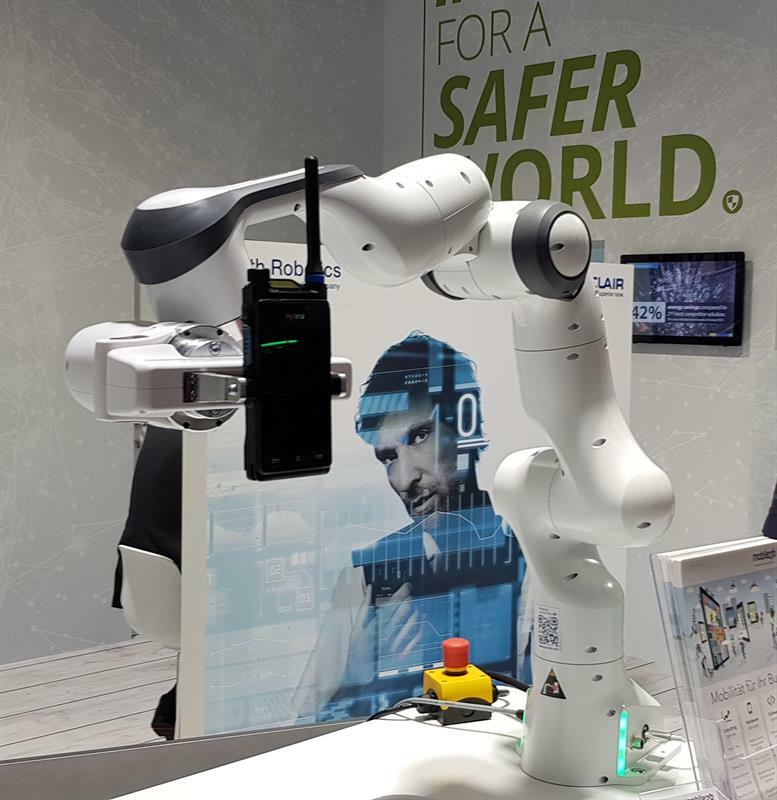 Also on the Hytera stand was a robotic arm that cycled through picking up and putting down one of the company’s multi-mode radios (shown below). A Mobile2b (a Cologne-based Hytera Mobilfunk application partner) representative showed me that it was linked to an app on a tablet that was counting the number of times the arm went through the cycle, and by scanning a QR code on the arm he could bring up the profile for it on a form-based app, making it easy to keep track of the asset’s condition. Another application of QR codes, this time in an emergency context, that was on show (on another stand) was RescueWave, an electronic triage tag for use during mass-casualty incidents. Vomatec Innovations’ Stephen Heuer, head of product management and research, told me that the tags are placed around the necks of those requiring medical attention and the dial on the tags can be turned to several colour-coded positions (with red reserved for those requiring the most urgent medical attention). As each tag has a unique QR code, first-responders can scan the code via an app to fill in or update a profile for each casualty. In addition, because the tags have GPS functionality, the incident controller is able to see all the locations of the casualties. The idea is that every ambulance would carry a bag containing a number of these tags (shown below), though I can see a need for a larger central pool for disasters with very high numbers of casualties. CommScope displayed its system for public-safety grade in-tunnel coverage (shown below) – according to Andreas Biehler, manager, business development EMEA, it supports frequencies of up to 1GHz (making it suitable for both TETRA and GSM-R) and is intended for railway and metro use. To summarise last year’s PMRExpo felt at times like an impossible task. However, I hope this has given you a good feel for what it was like to be there and that, like me, you are looking forward to this year’s event.